He continued his theological studies in the Monastery of saint Kouberyanous & Justina, Kfifan-Batroun, under the care of his teacher the saint Nehemtallah Kassab Elhardiny, who was the ideal for the monks and a living image of the great Sanctified Monks in his private & public life. On July 23, 1859 Brother Charbel MAKHLOUF was ordained a priest in BKERKY, by pu tting the hand of the triple-merciful Archbishop Youssef ElMarid, Vicar of the Maronite Patriarchy. Father Charbel lived in St. Maroun’s Monastery-Annaya for a period of sixteen years. He was obedient to his superiors, sticking to his monkhood law precisely. He was ruthless on himself by living strict austerity and mortification. He denounced all worldly materials in the earthly life, to go to serve his Lord and the salvation of his soul. 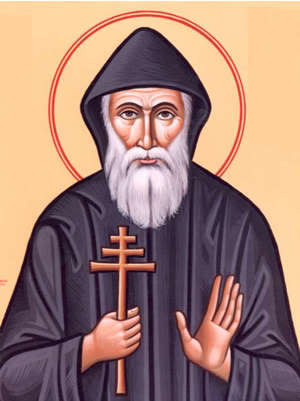 During the year 1875 God inspired father Charbel to live in hermitage in St. Peter & Paul which belongs to St. Maroun’s Monastery-Annaya, in spite of the fact that the superiors usually, do not allow seclusion in the hermit easily. While the father superior was hesitating, he received a sign from heaven visualized by the miracle of the lamp. As one night, Priest Charbel asked the servant to fill the lamp with oil, but instead of oil he filled it with water. But the lamp gave light ordinarily. This miracle opened the sequence of the Charbelite’s miracles, and approached the day destined for the hermit to go to his desired secluded home. On Feb. 15, 1875 priest Charbel moved definitively to the Hermit, where he was the ideal as a saint and a hermit, spending his time in silence, prayer, worship and manual labor in the fields. He never left the Hermit except in a permission of his superior. He followed the life path of the Saints hermit fathers, kneeling on a dish of canes in front of the Eucharist, whispering to it and inebriate by it throughout the nights. He spent 23 years in the hermit, dedicating himself to the service of his Lord, applying the rules of hermits with precision and full consciousness.